Ever since getting the iPhone or iPod touch, has that become your primary mobile entertainment device of choice, eschewing even the big screen HDTV you have at home simply because you want to spend a little quiet time with yourself and nobody else around the house? Well, you might get tired of holding the iPod touch in your hand all the time, especially when you’re watching a trilogy like Lord of the Rings extended edition, even if you’re the Incredible Hulk. 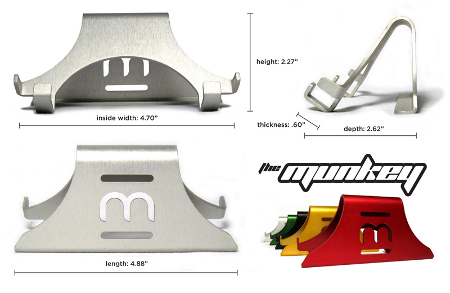 This is where the Munkey comes in, the first mobile device stand of its kind that also doubles up as a hanger. It comes in an assortment of choices and ensures that your hands are free to hold a can of beer and some chips in another while you enjoy your favorite movie. Now how about that!